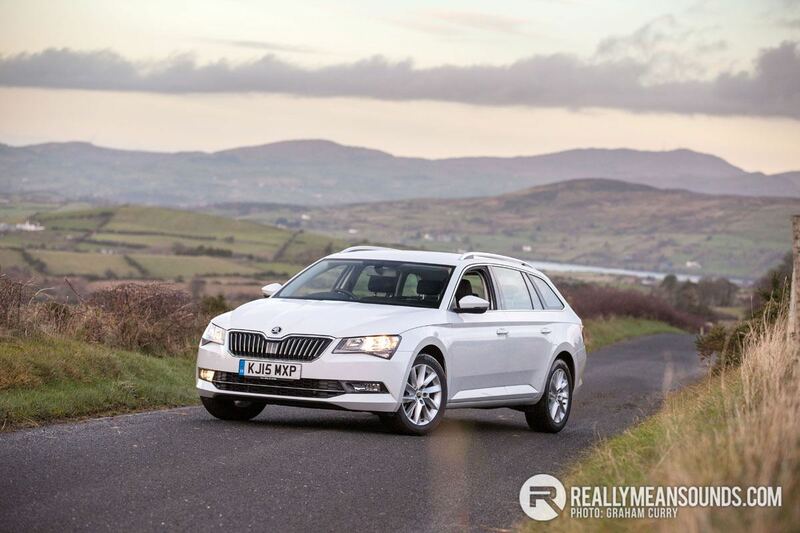 The Skoda brand has become the by word for affordable, reliable and practical motoring. The standing of the Czech brand has surged after being taken into the Volkswagen group fold. The Skoda family may not have the premium trappings of its Audi or VW siblings, but underneath the skin, the mechanicals are pretty much the same. For the vast majority of Skoda buyers, that’s all that matters. This latest version of the Superb has ditched the previous model’s bloated styling clean cut edges and intriguing angles, beautifully accentuated by the Moon White metallic paint on show here. Over the years, the Superb built an avid following for an unrivaled level of interior space. This model inherits that DNA and in tourer guise, the Superb is absolutely massive. The boot can only be described as a cave. If I ever required a car for a heist, this would be the top of my list! There is room for more swag than the Hatton Garden Robbers could ever wish for, but in the real world terms, it can easily swallow a couple of sets of golf clubs, a month’s shopping and still leave room for a buggy. Inside, it has a great spacious cabin, however I did feel the switch gear and plastics lacked a little quality. It’s no showstopper though, as the car is otherwise incredibly well equipped. The car on test here was fitted with one of the nicest touch screen infotainment systems I have used (a £1600 option) comprising of a massive 8 inch screen, DAB Radio, BlueTooth connectivity and navigation. The seats were comfortable and supportive, with chunky bolsters to hold the driver place. The rear seats offered similar levels of comfort with acres of leg room available. In fact, my rear seat passengers were so far away, I nigh on had to phone them, in order to have a conversation. This car came with a 1.6 TDi engine coupled to a six speed manual gear box with 120bhp on tap, which felt a little under-powered. Keeping up with traffic or moving swiftly on B roads required significant hustling which seriously ate into the claimed 67.3 mpg figures. During my week of driving, I saw no better than mid to high 40s. I have no doubt that on longer motorway type jaunts in sixth gear the claimed figures would be achievable with this engine. Though I would still opt for a larger diesel unit with more power and torque if I was parting with my hard earned. Driving the Superb estate was effortless, although driver feedback was minimal. The car is all about providing a relaxing, drama free drive, so it won’t inspire you to attack the bends. That said, road holding was smooth and I felt the car cornered well for its size, despite the vagueness of the steering. The car covered over 500 miles of mixed driving with ease and I was amazed at how well it absorbed the bumpy roads around the Mournes. Overall, it was an enjoyable if unmemorable experience. The Superb is by no means a dynamic car, but it is an incredibly capable load lugger with mountains of spec and is available from just £22k. All in all, a great package for the money with a proven reliability record and sound build quality. I really don’t know if there is much else on the market at this price point with so much gear and so much room inside. Have to agree the 2.0tdi is the one to go for. No doubt will be a favourite with Belfast taxi men. Brilliant review as always. Gave one of these serious consideration when I was buying the Passat. It was just a tad too big for the missus. | Brilliant review as always. Gave one of these serious consideration when I was buying the Passat. It was just a tad too big for the missus. Comfortable, no fuss to drive, all the toys. Like the sound of the new Superb. Is it really that big, though? Pity you didn't get the 280hp petrol one! I'd be very tempted by one next, depending how much they drop. Great cars. On a photographical point, excuse my ignorance but are photos with a central point in focus and the rest blurred deemed to be more appealing or arty? Theres just a few there (mainly the interior ones) it would be nice to make out everything in detail. Great review as ever, really are some size of a car. I agree the 1.6 TDI is pretty dead; I have it in an A3 I am driving and its tough going when you pull out to overtake on the motorway, definitely meant for cruising as opposed to pace. I am struggling to get more than 47mpg and that is on a commute of mainly constant driving. All the switchgear looks pretty similar to my old Jetta as does the steering wheel actually. | Pity you didn't get the 280hp petrol one! I'd be very tempted by one next, depending how much they drop. Great cars. On a photographical point, excuse my ignorance but are photos with a central point in focus and the rest blurred deemed to be more appealing or arty? Theres just a few there (mainly the interior ones) it would be nice to make out everything in detail.